A lithium battery option is now available on the Hurley davit H30 and H30+ models, available from sole UK and European distributor BHG Marine. The previous hard-wired version has been replaced by a wireless independent electric winch with a remote-control fob for a simple launch and recovery of a tender from the swim platform, explained BHG director Paul Martin. “The H30 model (rated to 180kgs) and the H30+ rated to take 326kgs) are now available as either manual winch operation or electric operation,” he said. “The lithium battery is self-contained and remote controlled. 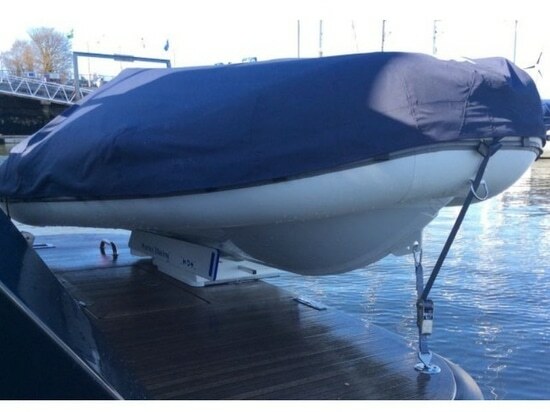 The Hurley davit system allows for retrieval and launching of both dinghies and outboard motors. The davits are made from corrosion resistant lightweight materials and can be removed so users can continue to use their swim platforms. The system can be retro-fitted.